There’s so much I have to say about this conference that I don’t know where to start. I am overwhelmed by the whole experience and I’m going to need some time to let it all percolate. For now though I will say that I am truly impressed by this conference and by the FORCE leadership. It’s a huge event and from a participant’s perspective it went off without a hitch. I know how much work goes into making an undertaking of this size go smoothly and Sue Friedman, Diane Rose, Sandra Cohen, Lisa Schlager, FORCE Philly, and no doubt a lot of people whose names I don’t even know deserve massive props for making it look so effortless. They have created an enjoyable, informative, and important event for BRCA+ women. Bravo! Before the conference, I tried to figure out a loose schedule of events that I wanted to attend by reading session descriptions and googling presenters. This didn’t work out so well, as you can see in the picture above, since there were so many sessions to choose from and often great sessions running simultaneously. 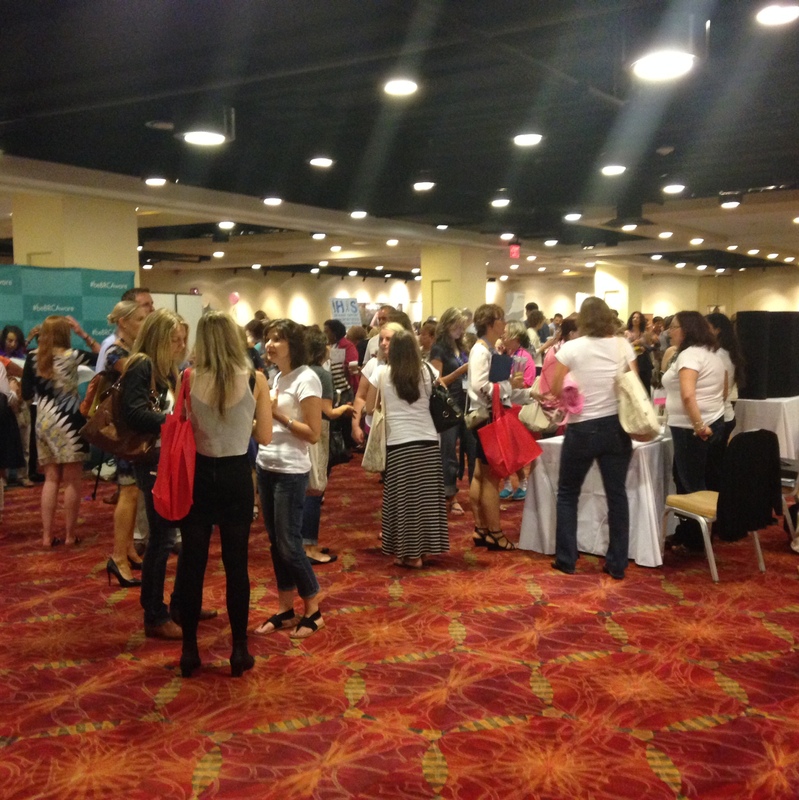 I went to sessions in every time slot and came away exhausted and excited. Out of the many sessions that I saw only one was disappointing (mostly because the speaker was visibly nervous–it’s a lot of pressure to talk to these big crowds of BRCA+ people). The others far exceeded my expectations. The exhibition area had booths for genetic testing companies, breast cancer nonprofits, surgical offices, and various odds and ends. I came away with tons of free swag and useful pamphlets. I was pleased to see two tables focused on African American women and breast cancer. The Basser Research Center for BRCA had several booths set up with information on various studies seeking participants. The biggest one was for a BRCA+ registry. In return for spitting in a test tube and going over your family medical history, participants got this t-shirt. I am more than happy to spit for BRCA+ science and would eagerly do it for any legitimate researcher who asked me to. I’m also thrilled to get a Basser Center shirt and will gladly shill for them whenever I can. 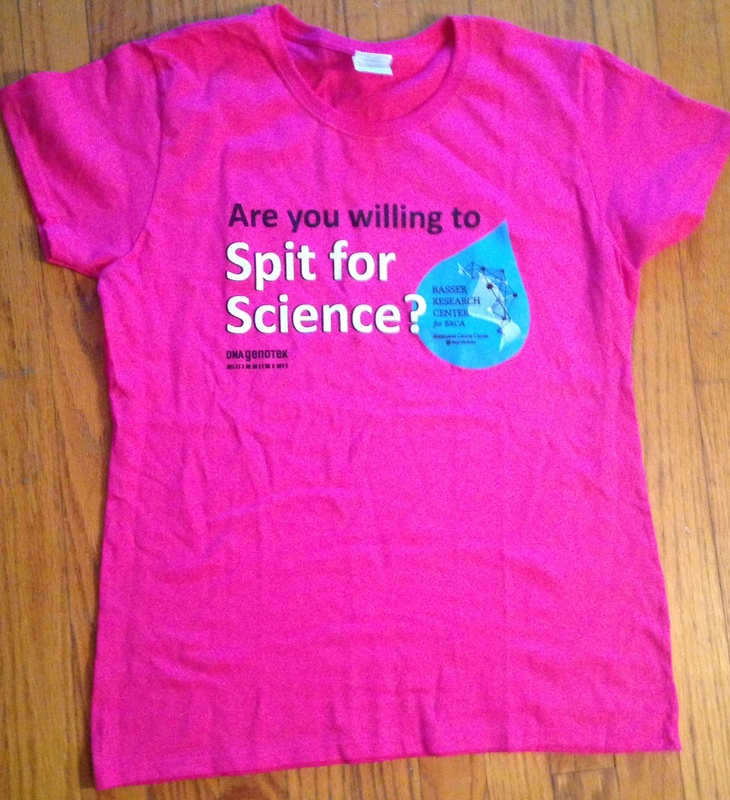 However, there’s no way in hell I’m wearing a shirt that says “Spit for Science” outside my house and this one has quickly been relegated to sleepwear. Y’all, next year please can you give us something a little less gross? I would love one with just a big Basser logo or DNA or something science related on it that I can wear to yoga. There were film crews in nearly every session for the upcoming documentary on BRCA+ men, Pink&Blue. I know this panoramic view is fuzzy and I tried at least seven times to get a better one with no luck. Still, look at all those people! There’s something wonderful about sitting in a packed room of people who know exactly what you’re dealing with. I’m not usually prone to the warm and fuzzies, but this conference left me feeling optimistic and happy. The conference was held in the Downtown Marriott right next to Reading Terminal Market–a fantastic location. 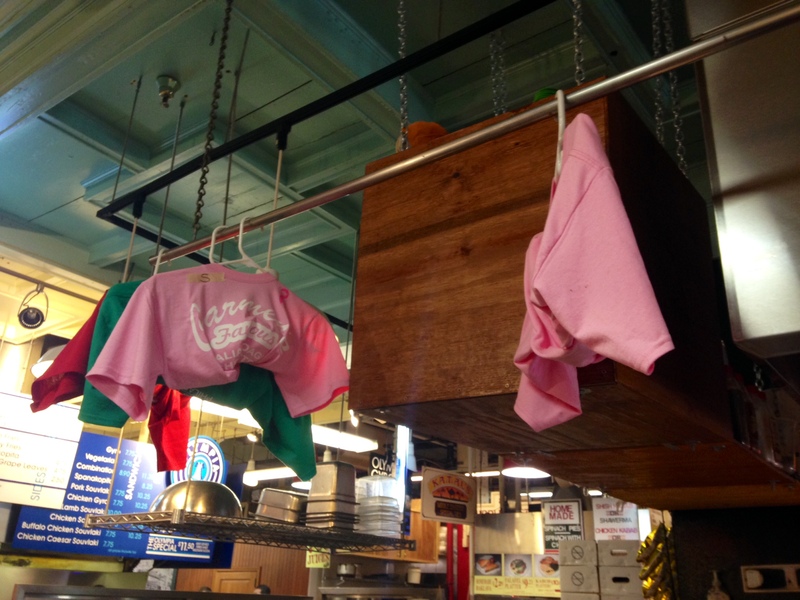 I popped in to get lunch and found some cliche pink breast cancer awareness stuff at Carmen’s cheesesteaks. If the line wasn’t so long I would’ve harangued the guy behind the register about where they send the money raised from t-shirt sales. You got away from me this time, Carmen Dude. 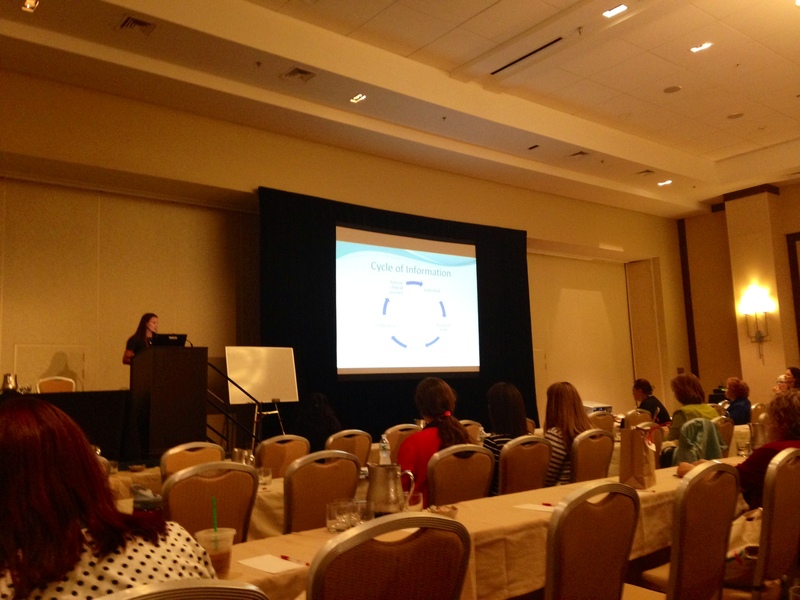 This is a picture of Tara Friebel explaining the cycle of information for medical research during her session on understanding research, risk, and statistics. I have more comments on this that I’ll save for another post. At this point, I will say how great it was to have direct access to BRCA researchers and clinicians like Tara. The sessions sometimes ran long and often there wasn’t much time for Q&A, but most of the time presenters stayed long after to answer questions about individual attendee’s particular situations. Most presenters were remarkably patient and friendly. 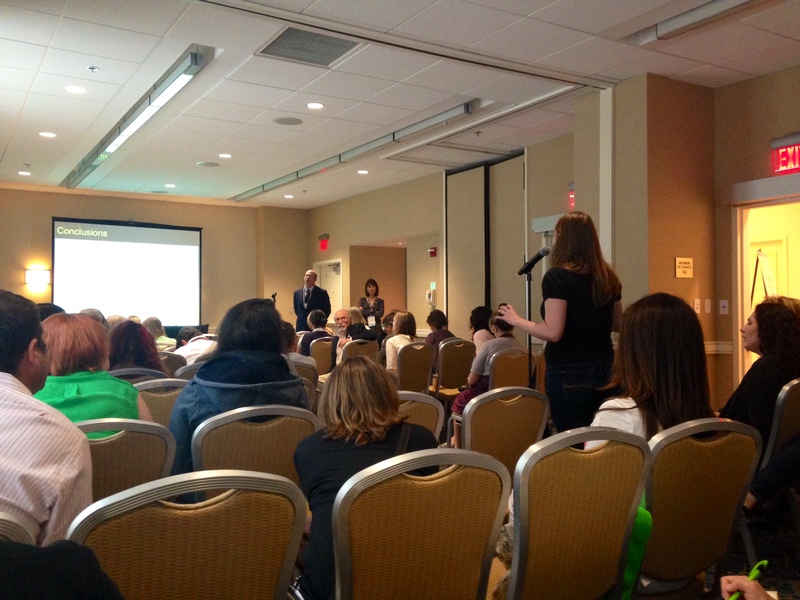 Here’s Andrea from Brave Bosom asking a question of Dr. Steven Narod after his presentation on genetic testing for BRCA founder mutations. I know it’s a cliche by this point to wax poetic about the potential of the internet to forge connections, but social media has been such an important resource for me while working through BRCA+ issues. It was really cool to finally meet Andrea and other BRCA+ women like Caroline from BRCAumbrella who I’ve been talking to on Facebook, twitter, and blogs. These women are just as awesome in person as they are online–nay, more awesome. In sum, I have very few complaints about the FORCE conference. There are a few things I’d like to see more of in the future–greater representation for GLBTQ and non-white women and more on the politics of BRCA/HBOC, for instance–but I think FORCE is doing a truly fantastic job with this event. 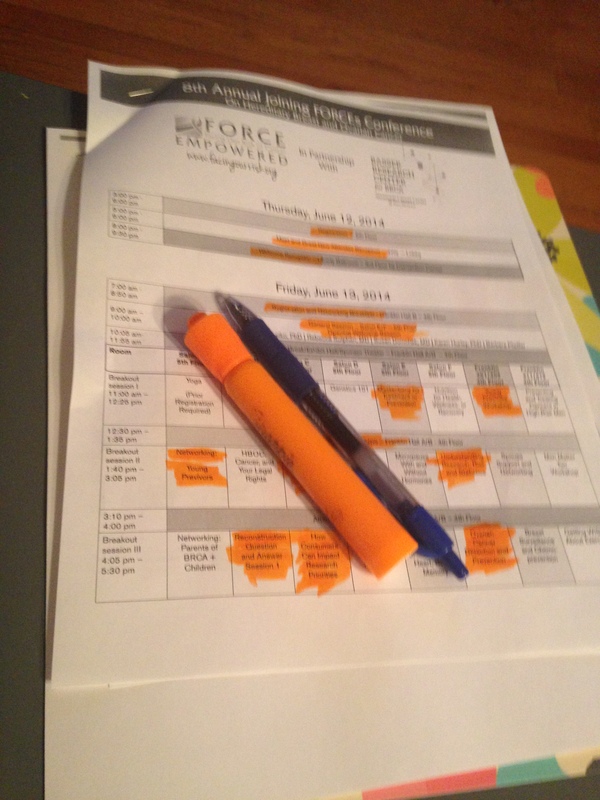 I hope to make it to #FORCE15 next year, which will be held in Philly once again. I thought that I was well informed about BRCA+ issues, but it’s clear to me that there’s even more to learn. Hello Risky Body – I just noticed this blog and this post in particular. My name is Karen Kramer and I work with FORCE and am sorry I did not get to meet you at the conference in person. I was wondering if I could email you. I would love to have a quote from you – a few sentences or short paragraph about how the conference educated and/or empowered you. I would like to use your testimonial to help promote next June’s conference. Is this something you are comfortable with? My email is Karenk@facingourrisk.org. I would also like to include your blog on our FORCEful Voices blogroll if you would like.